PremiumSportsCenter: IS THIS LIFE AFTER BALE? TOTTENHAM REMOVE GARETH BALE FROM THEIR OFFICIAL TWITTER PAGE, ALTHOUGH THEY CLAIM IT WAS DUE TO DEMPSEY'S EXIT. IS THIS LIFE AFTER BALE? 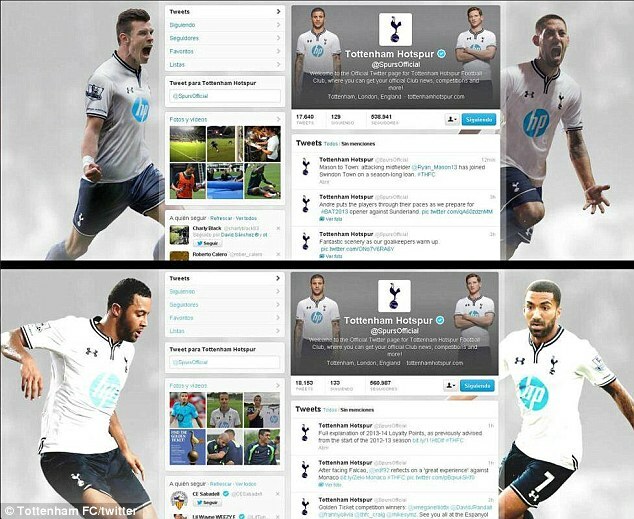 TOTTENHAM REMOVE GARETH BALE FROM THEIR OFFICIAL TWITTER PAGE, ALTHOUGH THEY CLAIM IT WAS DUE TO DEMPSEY'S EXIT. The images of American football(soccer) star Clint Dempsey, who recently completed a move to MLS side, Seattle Sounders and wantaway forward Gareth Bale have being removed from the twitter profile of Tottenham. This move by the north London club will do little to stop speculation of Bale's exit even though Tottenham claim the profile pictures was changed because Clint Dempsey left the club and has nothing to do with Bale. ''The images are changed regularly and in this case it was because Clint Dempsey has left the club and Bale still appears on the club's Google+ page'' a Tottenham spokesman insisted. The background picture is one image, and as such it's unfortunate timing for the club, with manager Andre Villas-Boas still convinced he can keep hold of his star asset. Bale is Tottenham's most marketable player, and is featured in the club's new home shirt on a billboard in New York's Times Square promoting NBC's coverage of the Premier League, as well as on the provisional cover of EA Sports' FIFA 14.